What is the most popular gun book ever published? That distinction goes to the Shooters’ Bible, which has sold over 7 MILLION copies since it was first published over 80 years ago. The 104th Edition of this respected resource was released last month — and it is bigger and better than ever. 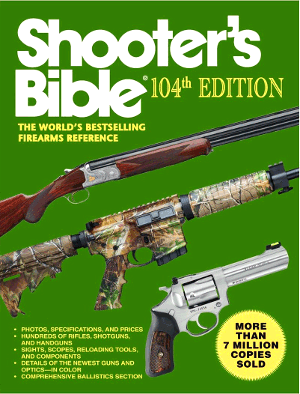 This latest Shooter’s Bible boasts 608 pages with 275 color photos and more than 1000 b/w photos. You’ll find photo-illustrated listings of the latest products from major gun-makers. Published annually for more than eighty years, the Shooter’s Bible is perhaps the most comprehensive reference guide for firearms and their specifications. The publishers claim that “every firearms manufacturer in the world” is included in the Shooter’s Bible. The 104th edition also contains new sections on ammunition, optics, and accessories, plus up-to-date handgun and rifle ballistic tables. There are also extensive charts of currently available hunting and match bullets for hand-loaders. Share the post "104th Edition of Shooter’s Bible Released"
The National 3-Gun Association, which operates the 3-Gun Nation Pro Series and 3-Gun Nation TV, has launched a new e-Zine dedicated to 3-Gun Competition. 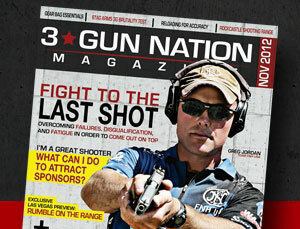 Entitled “3GN Magazine”, this new e-Zine features match reports, gear reviews, and shooting tips. You’ll find a host of 3GN videos, including match footage, product reviews, and instructional segments. Ace 3-gunners will contribute to the articles along with leading outdoor industry journalists. Comprehensive match coverage will include local club matches, regional tournaments, national Outlaw matches, and, of course, the 3GN Pro Series Tour. The first installment of 3GN Magazine can be previewed now on the 3gunnation.com website. There is also a mobile version of 3GN Magazine optimized for smartphones and tablets. 3GN Magazine is offered free to the public, but you can choose to be added to a subscriber list to be notified directly of new releases and special offers for fans of the 3-Gun sport. Share the post "National 3-Gun Association Launches New Digital e-Zine"